Borgund Stave Church is a stave church located in the village of Borgund in the municipality of Lærdal in Sogn og Fjordane county, Norway. 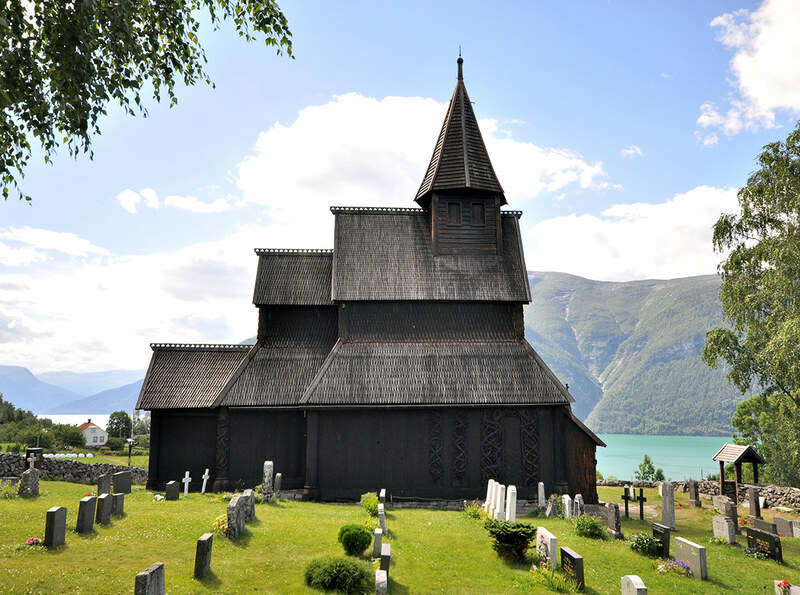 It is classified as a triple nave stave church of the so-called Sogn-type. 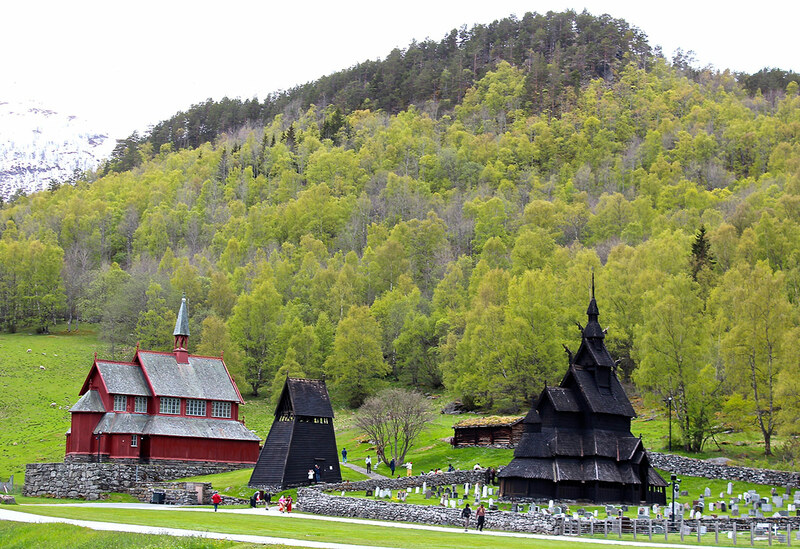 It is also the best preserved of Norway’s 28 extant stave churches. 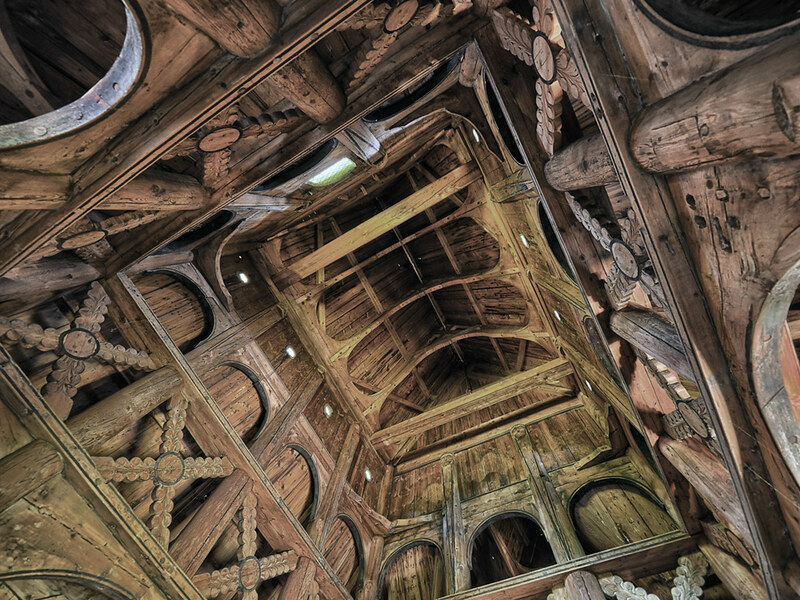 Stave churches were once common in northern Europe. In Norway alone, it was thought about 1000 were built; recent research has upped this number and it is now believed there may have been closer to 2000. 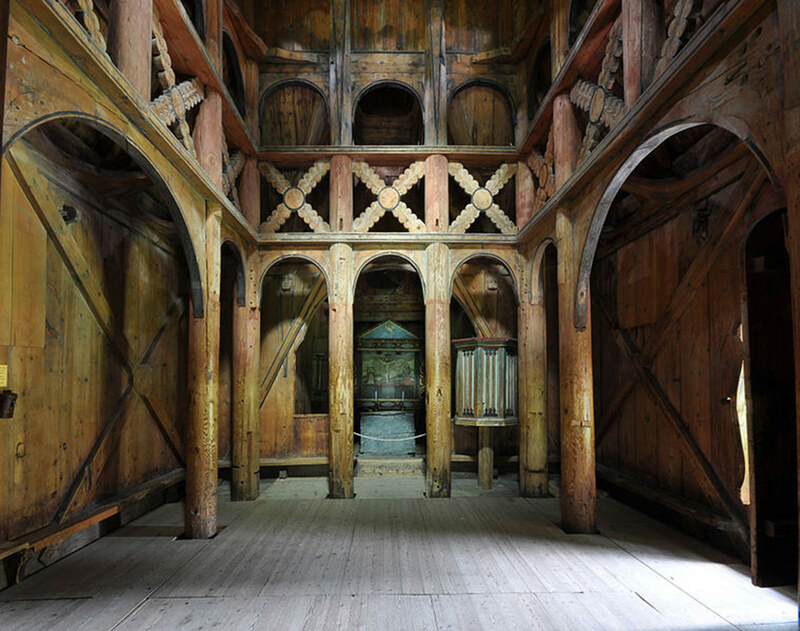 It is unknown how many stave churches were constructed in Iceland and in other countries in Europe. Some believe they were the first type of church to be constructed in Scandinavia; however, the post churches are an older type, although the difference between the two is slight. 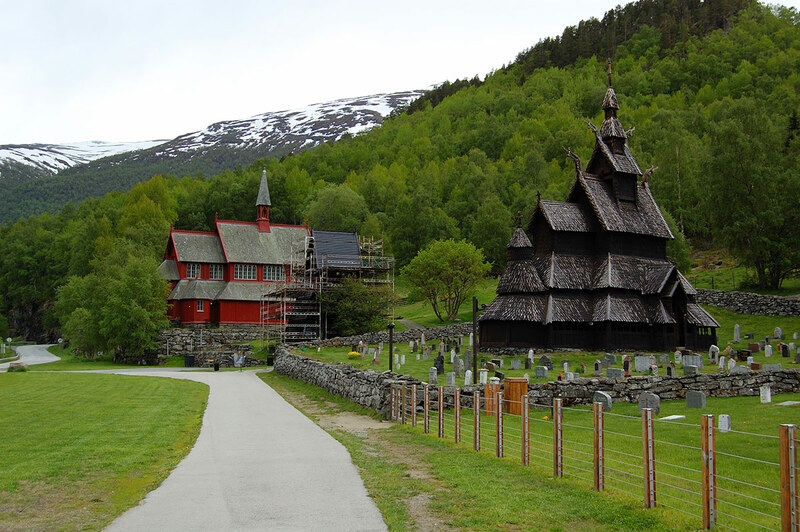 A stave church has a lower construction set on a frame, whereas a post church has earth-bound posts. 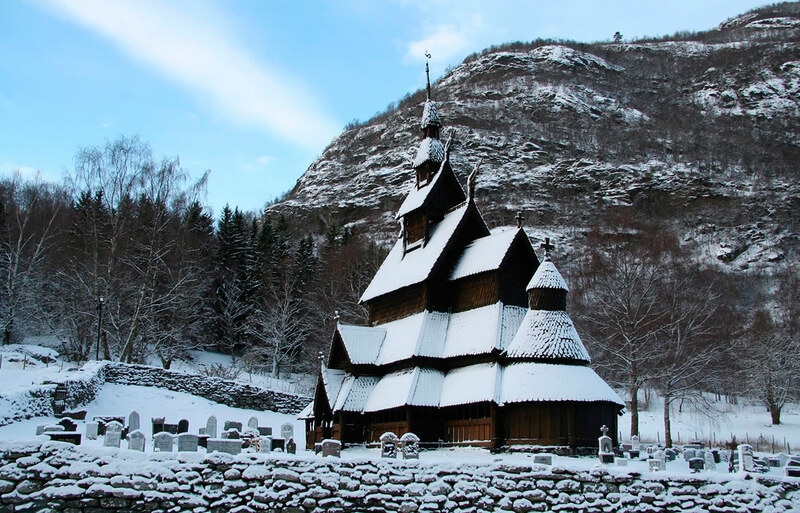 Borgund Stave Church was built between 1180 and 1250 AD with later additions and restorations. 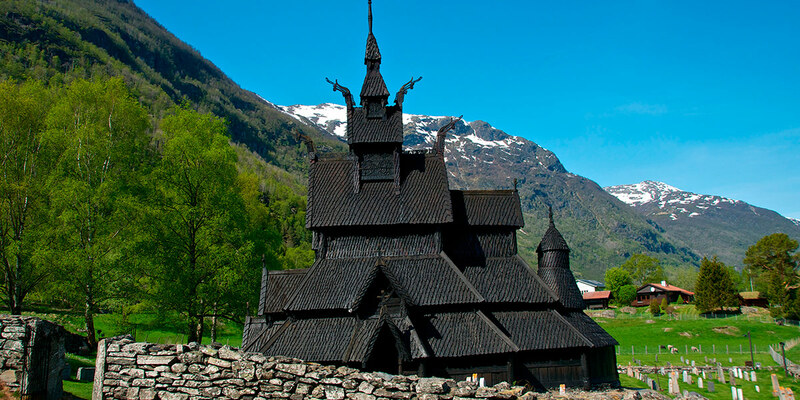 Its walls are formed by vertical wooden boards or staves, hence the name “stave church”. The four corner posts were connected to one another by ground sills, resting on a stone foundation. The rest of the staves then rise from the ground sills, each stave notched and grooved along the sides so that they lock into one another, forming a sturdy wall. 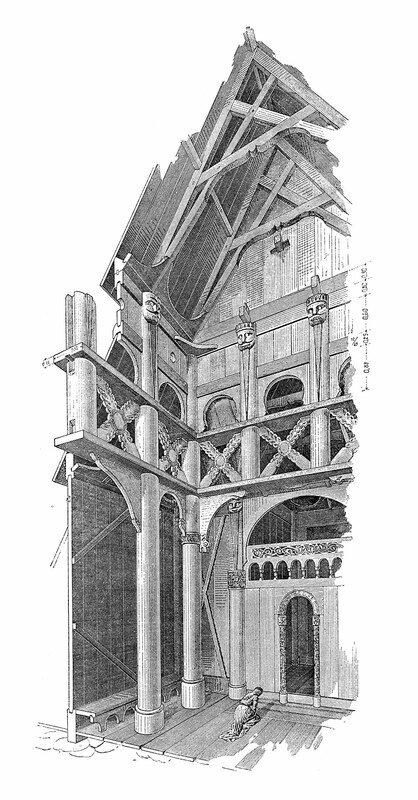 Borgund is built on a basilica plan, with reduced side aisles, with an added chancel and apse. It has a raised central nave demarcated on four sides by an arcade. An ambulatory runs around this platform and into the chancel and apse, both added in the 14th century. An additional ambulatory, in the form of a porch, runs around the exterior of the building, sheltered under the overhanging shingled roof. 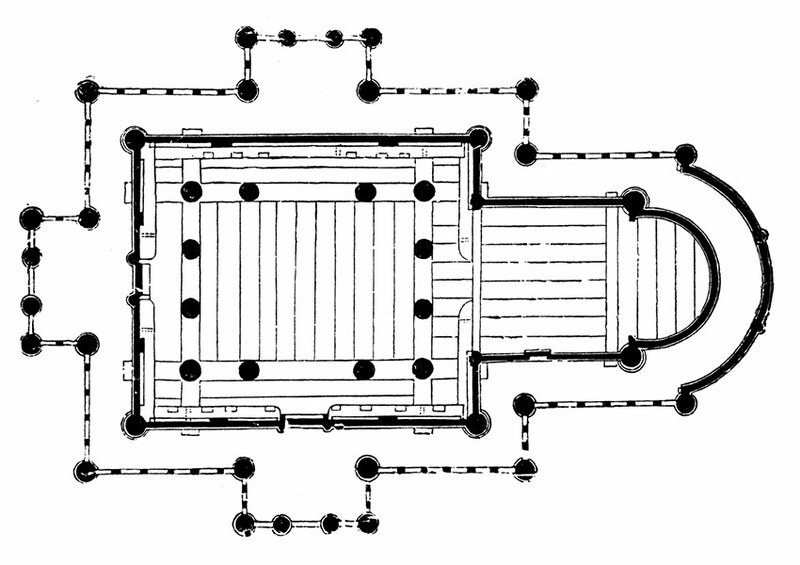 The floor plan of this church resembles that of a central plan, double-shelled Greek cross with an apse attached to one end in place of the fourth arm. The entries to the church are in the three arms of the almost-cross. The ceiling is held up with “scissor beams” or two steeply angled supports crossing each other to form an X shape with a narrow top span and a broader bottom span. The lower ends of the X shape are joined by a bottom truss to prevent the X from collapsing. In the case of Borgund, an additional beam cuts across the X below the crossing point but above the bottom truss, for extra stability. This stabilizes the steeply pitched roof, consisting of horizontal boards covered in shingles. Originally, the roof would have been covered on the outside with boards running lengthwise, like the composition of the roof beneath it, however in later years wooden shingles became more common. 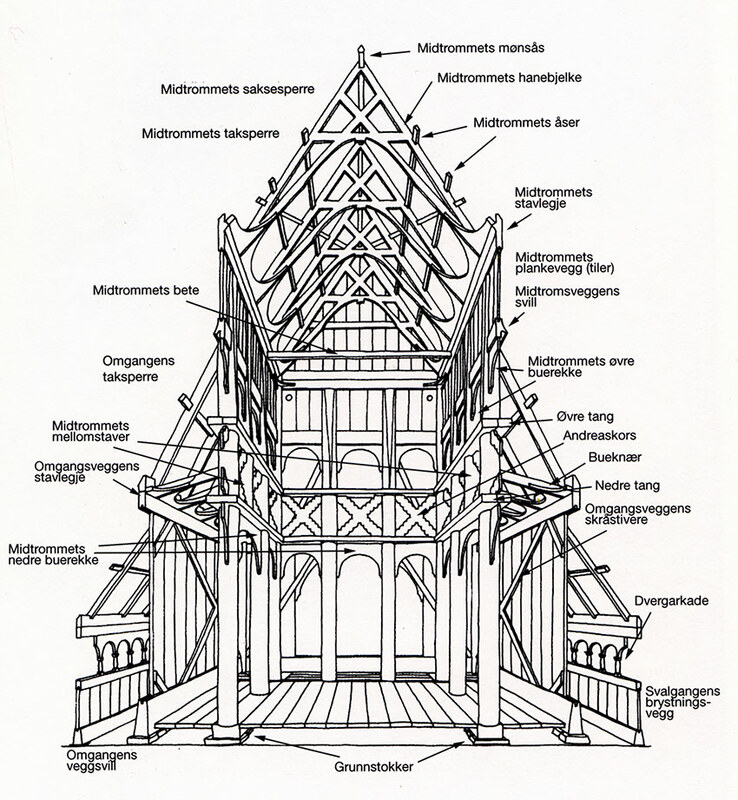 Scissor beam roof construction is typical of most stave churches. 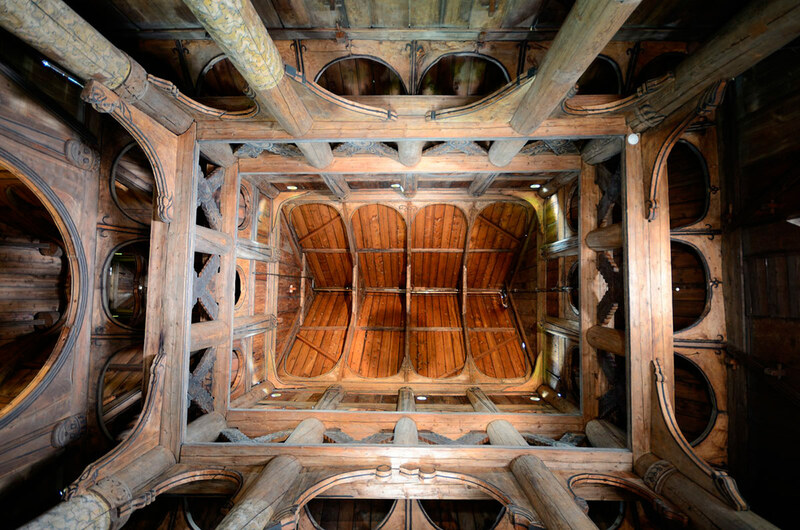 Bracing in the form of cross-shaped trusses also appears on the walls of the building itself, diagonal beams running up the walls from the floor to about level with the top of the arcade. Further crossing, this time in a more ornamental sense appears in the cross-shaped carvings with medallions in the center, commonly dubbed “Saint Andrew’s crosses” which run along the area above the arcade, in the visual “second story” that is not actually a gallery but is located where one is commonly put in large stone churches elsewhere in Europe at this time. Near these smaller crosses are the pincer beams, running between the columns to help further wedge everything firmly together. The most important bracing elements are the carved buttresses that are supported by knee joints and arc upward from the outer wall to the top of the arcade as these help to support the outward thrust on the stave walls. 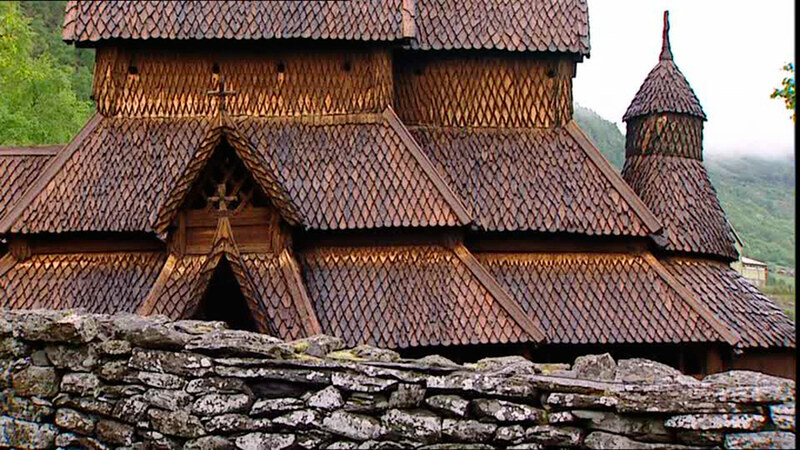 Borgund has tiered, overhanging roofs, topped with a tower. On the gables of the roof, there are four carved dragon heads, swooping from the carved roof ridge crests, recalling the carved dragon heads found on the prows of Norse ships. Similar gable heads also appear on small bronze house shaped reliquaries common in Norway in this period. Borgund’s current dragon heads possibly date from the 18th century, however original dragon heads remaining on earlier structures, such as Lom Stave Church and nearby Urnes Stave Church, the oldest still extant stave church, also in the Sogn district, suggest that there probably would have been similar dragon heads there at one time. Borgund is one of the only churches to still have preserved its ridge crests, carved with openwork vine and vegetal repeating designs. The dragons on top of the church were often used as a form of drainage. 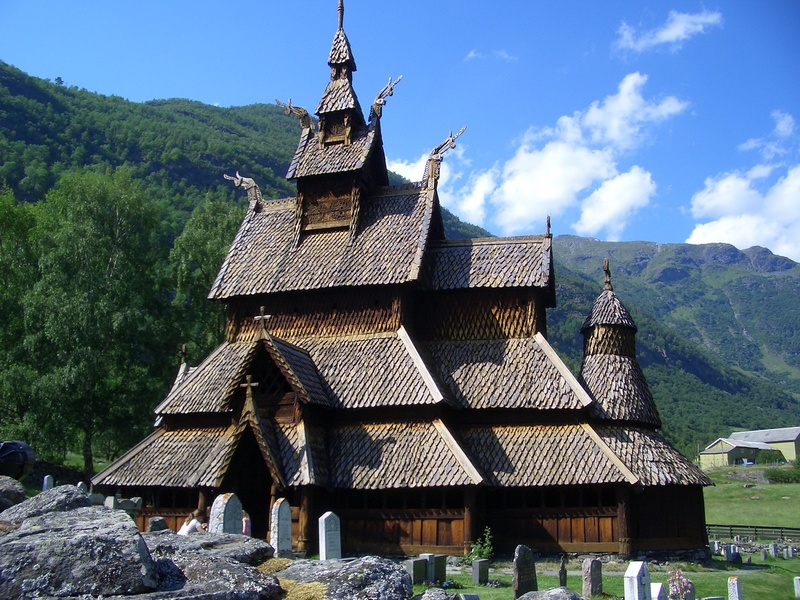 Cite this article: "Borgund Stave Church," in ArchEyes, July 13, 2016, http://archeyes.com/borgund-stave-church/.